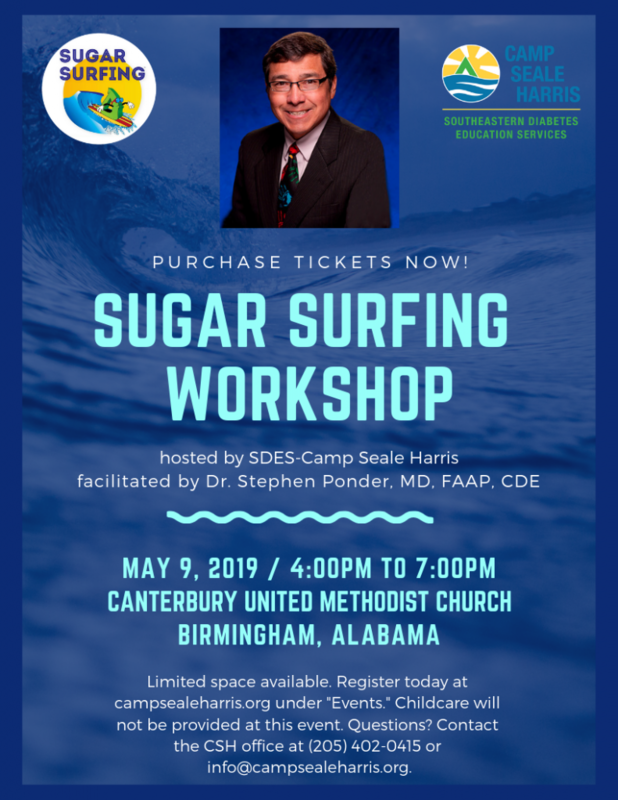 Camp Seale Harris invites the Type 1 community and the public to a Sugar Surfing Workshop facilitated by Dr. Stephen Ponder, MD, FAAP, CDE on May 9, 2019 from 4-7 p.m. at Canterbury United Methodist Church in Birmingham, AL (directions below). Adults living with Type 1 Diabetes, parents of children with Type 1, and health professionals throughout the US have enjoyed this interactive workshop based on Dr. Ponder’s “Dynamic Diabetes Management” methods. Dr. Ponder, author of Sugar Surfing – How to Manage Type 1 Diabetes In a Modern World, is a Board Certified endocrinologist who personally lives with Type 1. He was recently named the 2018 Diabetes Educator of the Year by the American Association of Diabetes Educators. You might be thinking – what is sugar surfing? “Sugar Surfing describes the discipline of diabetes self-management ‘in the moment’ using frequent pattern management enabled by either continuous glucose monitoring or frequent BG checks using a standard hand held blood sugar monitoring device.” (via sugarsurfing.com) Learn more about Dr. Ponder here. Advance ticket purchase is required, and seating is limited, so reserve your spot today! A boxed sandwich meal is included in your ticket price. Workshop is interactive, fun, and visual. This event runs 3 hours from 4-7 p.m. with a 30 minute intermission including boxed dinner. Well behaved and attentive children and teens are welcome. Dr. Ponder’s book, Sugar Surfing – How to Manage Type 1 Diabetes In a Modern World, is not available for purchase at the event. We recommend purchasing in advance if you are interested in the book signing.